Shirts With Random Triangles: LSU vs. Penn St. Is The Most Popular Projected Matchup For The 2016 TaxSlayer Bowl. LSU vs. Penn St. Is The Most Popular Projected Matchup For The 2016 TaxSlayer Bowl. Action from 2015 TaxSlayer Bowl. Image via Bleacher Report. While it looks as though the Miami Beach Bowl reportedly had its participants all but set in stone (South Florida vs Western Kentucky), it probably won't be until the conference championships are over until the higher profile bowls have their lineups in place. That's especially true for the TaxSlayer Bowl (aka The Bowl Formerly Known As The Gator Bowl), where eleven analysts name ten teams that could be going to Jacksonville in January. There is two teams that do get projected to face each other more than the others, however: Penn State and LSU. Location: Everbank Field, Jacksonville, Fl. 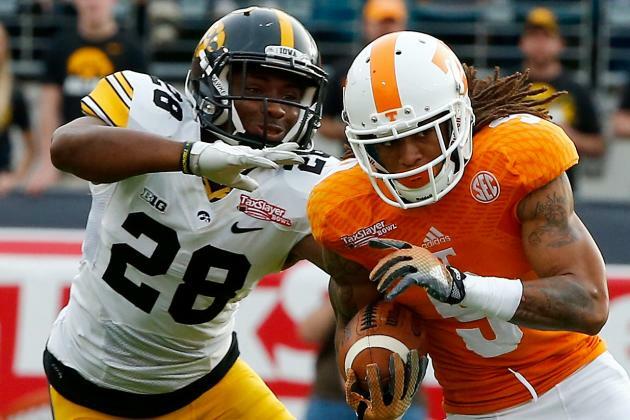 Who do the analysts say will play in the TaxSlayer Bowl? Of eight different possible matchups projected by the analysts. LSU vs. Penn State shows up four different times.